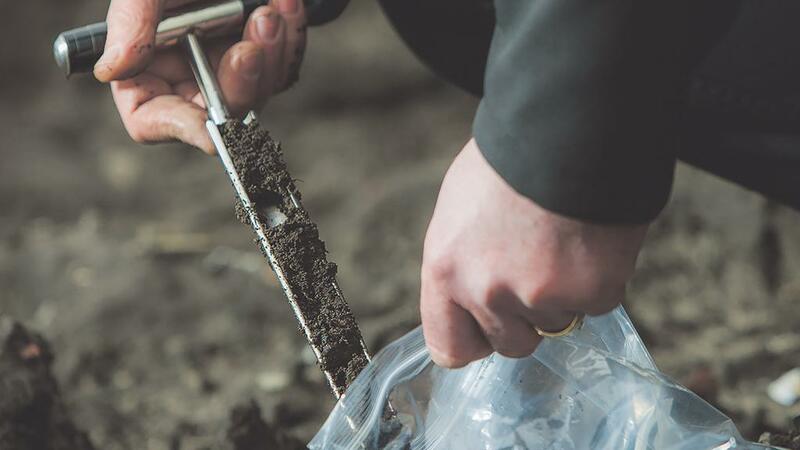 Greater use of soil analysis, more detail in what is analysed and the need to carry it out across a range of fields, are all top of the agenda as far as the experts are concerned. Wynnstay fertiliser manager, Dave Mitchell makes the point soil is the foundation of everything which is done on a grassland farm. Mark Tripney is an independent consultant providing advice on soil and nutrient management to farmers and landowners. He also has experience of running a dairy herd and understands the day-to-day challenges of livestock farming. He is keen to emphasise the need for greater use of analysis in planning – not just for grass production but across the board, including the effect on herd health and productivity. He says: “There’s a tendency when grassland farmers get to the end of the season to shut the gate and leave it until into the new year. There needs to be more planning. Soil management starts with inspection post use and then asking ‘what do we need to do for next season – do we need to sub-soil, do we need to aerate, or add lime?’. “You need to look at broader spectrum analysis as this may highlight issues such as soil structure. Soil structure is not just a physical thing, it is chemistry, biology and physics. All of these things are interrelated and if the chemistry is wrong it’s very likely the physics is wrong too. If the physics is wrong, you have no biology because soil needs to be aerobic. “We can push metal through and there’s no doubt this assists in getting the biology moving again, but if we don’t treat the chemistry then we don’t get the physical structure sorted. Get the chemistry right and then you get soil flocculation, air space, root development and drainage and the biology will thrive. Most of the problems with grassland are to do with a lack of soil biology. “There’s a belief we need to re-seed every five years. This is only necessary if you do not manage the soil properly. If we over-apply slurries and under-apply calcium – which is fantastic for soil structure – then we will need to re-seed regularly. With good soil management, we can ensure our grassland lasts longer. Mr Tripney says all fields on-farm should be regularly sampled in order to understand how previous decisions have impacted and how things have changed. Grass has the potential to remove a massive amount of nutrient annually. For instance, over the season a 50-tonne/hectare crop of silage will remove 300kg/ha of potash. He says: “Soil sampling should be taken as an opportunity to look at more than the basic soil [P, K,Mg and pH] and explore the levels of all the nutrients which have the potential to have an effect on the health of the soil, plants and animals. “Broader spectrum soil analysis in several formats is available from many labs in the UK, and these provide useful data which can indicate deficiencies and excesses which can impact on health on the farm. “Data from Lancrop – one of the labs providing broad spectrum analysis – has, for example, shown over several years 60% of grassland soils tested are short on calcium. This element, while important in the management of a soil’s pH and its structure, is also vital in the development of cells. “A soil which is short of calcium will show poor structural qualities as this element is crucial to its flocculation, which promotes the pore space which allows it to function aerobically, drain and allow root penetration. If a soil has good reserves of calcium the crop grown will be of much higher quality producing better yields which have increased digestibility, better storage and ensiling qualities. Mr Tripney believes planning should go beyond soil and fertiliser to a holistic approach which involves the feed adviser and even the vet. Grassland management, herd health and productivity are all just different aspects of the same overall plan. Yara’s country agronomist Philip Cosgrave agrees decisions taken on soil health can influence cow health as well. In particular, he highlights the role of selenium. He points out something like 75% of soil samples submitted to Yara Analytical Services – Lancrop Laboratories – have insufficient levels of selenium. For Wynnstay’s Mr Mitchell another area of concern is the use of farmyard manures and slurries. He believes better use of these should all be part of the broader plan. “If we understand their value we can include them in the overall fertiliser regime and make sure they are used effectively and efficiently. When seeking advice on grassland agronomy it is worth bearing in mind that the industry’s training and accreditation organisation BASIS provides training to agronomists on grassland and forage. As well as a specific course, the BASIS Certificate in Crop Protection – Grassland and Forage Crops, is Ea statutory requirement for any person selling or supplying pesticides for use on agricultural crops such as grassland and forage crops. Grassland and forage are also included in its main BASIS Certificate in Crop Protection (Agriculture).